Acrylic Candy Jars compared to plastic and glass confectionery containers are simple in retrospect. Acrylic candy bins are less fragile and cheaper than glass bins. They do not yellow in time like plastic and are scratch resistant and potentially shatterproof. Our clear storage containers for candy are eye-appealing to your customers, keeps your sweets fresh with the lids, and less accidental incidents with these clear candy bins. Your sweet merchandise or other products will pop in these clear vessels. Create your own candy buffet display for special occasions, holidays, graduations and more. Step back into time with our variety of Penny Candy Jars. 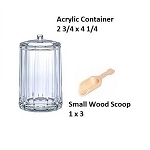 These lovely acrylic jars come with a chrome colored lid with a round ball shaped handle. These containers can sit straight up or at an angle offering easy access to your sweet treats. If you are looking to set-up a candy station take a peek at the penny candy jar with rack. You get six lidded acrylic jars that sit on a powder coated black metal rack. Ideal for countertops, food buffets and more. All Candy Containers offers you various shapes and sizes of candy jars. See for yourself our Eggplant Shaped Container, Straight Top seal-able jars, Acrylic Jars with wooden scoops to go with it, and Angled Tubes that include a plastic resealable lid. Our Acrylic Candy Jars add character and style to any display, whether its for candy buffets, bakeries, or as a gift. They are gifts that keep on giving. Customers can reuse these clear candy bins for other purposes. Save money but still have a dependable retail candy shop container when you purchase our Acrylic Candy Jars. Come see for yourself and potentially increase your sales and customer base by ordering our clear and dependable sweet bins!